Andhra Pradesh (AP) State Government has offered Post Matric Scholarship for Students who belong to the categories of SC,ST whose annual parental income is Rs. 2 Lakhs or below and BC,EBC,Disabled Welfare Students whose parental income is RS. 1 lakh or below.students must be have 75% attendance at the end of each quarter. scholarship which is granted to students by the welfare departments of the Govt. for enabling eligible students who have passed tenth class (SSC examination or equivalent to pursue post matric studies such as intermedeate, ITI, polytechnic, professional courses, graduate and post graduate courses, Ph.D etc. A post matric scholarship has two components namely reimbursement of tuition fee (RTF) to the college and maintenance fee to the student (MTF). Scholarships are granted only after admission to a college and is subject to verification and eligibility. Only those who are eligible will be granted a scholarship. students who belong to the categories of sc,st whose annual parental income is rs. two lakhs below and bc,ebc,disabled welfare students whose parental income is rs. one lakh below. whose attendance is 75 at the end of each quarter. All Post Matric Colleges in Andhra Pradesh recognized by Government of Andhra Pradesh/Competent Authority. 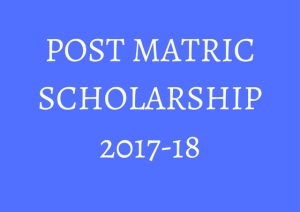 How to apply AP Post Matric Scholarship 2017-18 ? The scholarship registration is open only for a specific period of time by the government. All students and colleges must file their application for registration only during this period of time. once the period is over the facility for registration will no longer be available on the website. Than Enter your "SSC Examination Details" like as SSC Hall ticket Number, Year of Passing, DOB etc. it will be redirected to New page, Here will be Enter your Course details like as College Name, Course Name, Bank Details, Collage Address, Distance of College, etc. Click on "Print" Button for take Print out copy of Acknowledgment Receipt for future Reference. How to check AP epass Scholarship status online ? click on the "Scholarship status" button given in middle of web page. Furnish your application ID and other details are required. Upon furnish the details you will get a detailed statement showing the different transactions on your application.